The holiday-centric horror-movie series INTO THE DARK tackles that most romantic of dates with DOWN, the installment premiering on Hulu today—though security-cam shots in the opening moments reveal that the story begins a day earlier: on Friday the 13th. That’s the first hint that the meet-cute between its two protagonists will lead to bad luck for both of them. 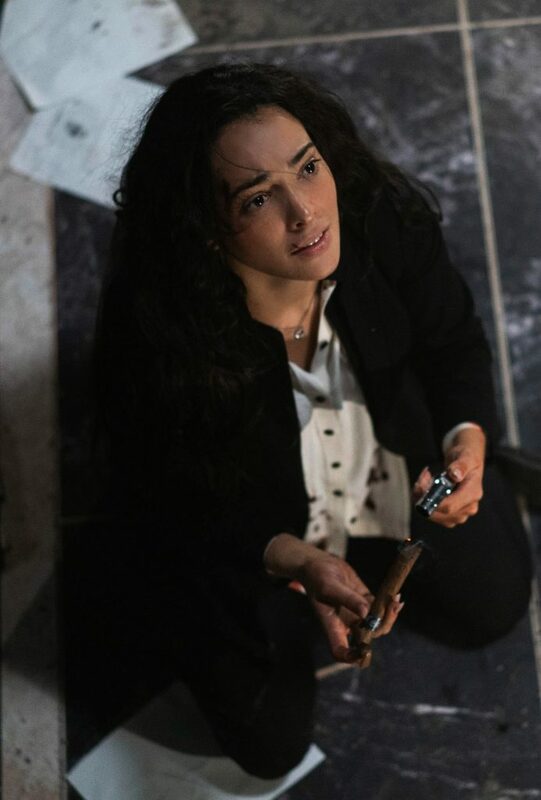 In a metropolitan office building on a stormy night, Jennifer (Natalie Martinez) and Guy (Matt Lauria) are working late, and the last ones to leave for the long Valentine’s Day/President’s Day weekend. They wind up on the same elevator, and as it descends into the subterranean parking area, their car suddenly stops between floors. The call buttons aren’t working, and there’s no escape hatch in the ceiling. Looks like they’re stuck there for a while, but director Daniel Stamm (THE LAST EXORCISM) and writer Kent Kubena don’t jump into the tense possibilities of the situation right away. They give Jennifer and Guy time to get to know each other, and for us to get to know them, as they take stock of their predicament and each other. First there are the practicalities, as when Jennifer has to pee. Then, as they continue to talk, they open up to each other about increasingly personal subjects. It just so happens that Guy has a bottle of wine on him, which helps loosen inhibitions. Since we’re watching a horror story, we know things won’t end well for this burgeoning couple, and the gradual buildup helps tease our expectations. Will this be a chronicle of a relationship gone bad in microcosm, or will some outside presence or force arrive to threaten them? When the story takes the turn that sends the scenario into the horrific, it is, disappointingly, one that sends DOWN into territory we’ve been through many times before (very specifically in one decade-old film, which I won’t spoil here). The revelation leaves the movie with nowhere to go but down a familiar path; it might have been quite a bit more interesting, or at least unexpected, if the roles of the two characters in it were reversed. There’s an evident intent to address a topical subject here, which does land when Guy reveals part of his personal history, but for the most part, the second half of DOWN has the feeling of the inevitable playing itself out, and is dependent on one of its characters making a couple of very foolish decisions. That’s a shame, since during the lengthy first act, Stamm works well in the confined setting, keeping the shots varied and the pace moving, and he also handles the later close-quarters action well. Martinez and Lauria develop a nicely awkward-to-ingratiating chemistry as Jennifer and Guy’s barriers start to come down, before they become players in a conventional game. This could have been a great date movie for lovers of twisted romantic tales; instead, its disinterest in pursuing more adventurous directions becomes a dealbreaker.